We learn much better if we associate words with pictures. Our brain remembers better that way. That is why it is recommended that we use picture dictionaries (Bildwörterbücher) while learning some foreign language. Take a look at the below list of picture dictionaries and use them online. They are all free! Attention teachers! There is also something which might be interesting for you: a tutorial about how you could work with picture dictionaries in your classes. Mini-Bildwörterbuch Deutsch This is something good for a start. 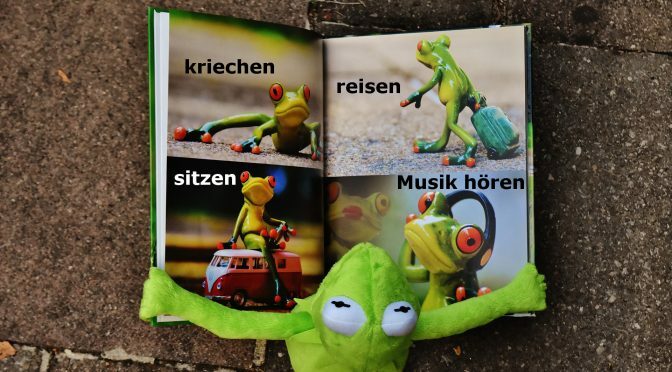 Learn your first German words with this mini picture dictionary. It’s actually a PDF file. The Internet picture dictionary actually provides picture dictionaries for many different languages: English, French, German, Italian Spanish. You can choose between these categories: Animals, Appliances, Body Parts, Clothing and Apparel, Colors, Fruits, Garden and Yard, Kitchen, Musical Instruments, Numbers, School, Sports, Tools, Transportation and Vegetables. You can intensify the learning process by playing these games: Flashcards (try to guess the word, and move your mouse pointer over a picture to see if you are correct), Fill-in-the-blanks (fill in the missing letters), Word Scramble (rearrange letters so they spell the correct words), Stinky Spelling (correct incorrectly spelled words) and Straight Recall (click on the box corresponding to the term pronounced). The greatest weakness of this dictionary is that it doesn’t provide sound/pronunciation. 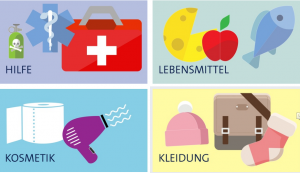 Online-Bildwörterbuch – learn English and German in pictures! 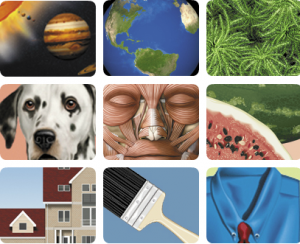 There are more than 6000 words in 17 different categories: Astronomy, Earth, Vegetable Kingdom, Animal Kingdom, Human Being, Food And Kitchen, House, Do-It-Yourself And Gardening, Clothing, Personal Adornment and Articles, Arts and Architecture, Communications and Office Automation, Transport and Machinery, Energy, Science, Society, Sports and Games. There are also some games that can help you master the vocabulary: Put It In Its Place (Slide the term appearing at the bottom of the page to its correct position) and Listen Up (associate sound with images). The greatest weakness of this dictionary is also that it doesn’t provide sound/pronunciation. At least not during the learning process, but only during the test phase. Lingudora – learn English, German and Korean through interactive exercises. You can learn and practice vocabulary and pronunciation at the same time. There are several different categories: Colours, Refrigerator, Lunch, Kitchen, Dinner, Breakfast, Kitchen Table, Face, Body, Bedroom., Clothes, Island, Beach, Campfire, Map, Hallway, Living Room, Bathroom, Office, Landscape, Traffic, Classroom, Santa Claus, Christmas. When learning you go through three phases: 1. Explore. Here you will be able to explore the spelling and pronunciation of words. 2. Practise. Now you can try to remember the meanings of the words. Listen and read the word and click on the appropriate bubble. 3. Test. At the end you can test whether you actively master the vocabulary. A question mark appears in one of the speech bubbles. First click on the determiner and then click on the letters in the correct order to form the word. In addition, you can also train your listening comprehension, then learn or review the most important verb forms in the present tense. There is also a list which provides an overview where you can find mp3 sound files and translations of over 700 words. Days of Deutsch – learn German with modern photos, word by word, image by image. “Some of it is useful, some of it is utterly useless”, however they are sorted by their genus. You can follow this page on Instagram and Twitter. This dictionary also does not provide sound/pronunciation. 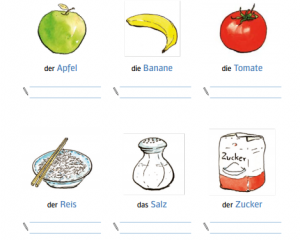 ARD-Bildwörterbuch – learn everyday German with this visual and audio dictionary. 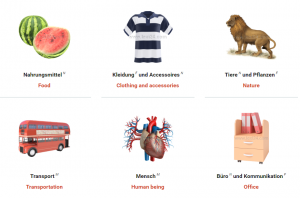 It is intended for refugees, however it can help you master the everyday life in Germany also if you are not a refugee. New words are being added regularly. The categories: First Aid, Food, Leisure time, Cosmetics, Clothes, Calendar, Children, Weather, Colours, Numbers, Animals, Money, Housekeeping, Communication, Education, Law. 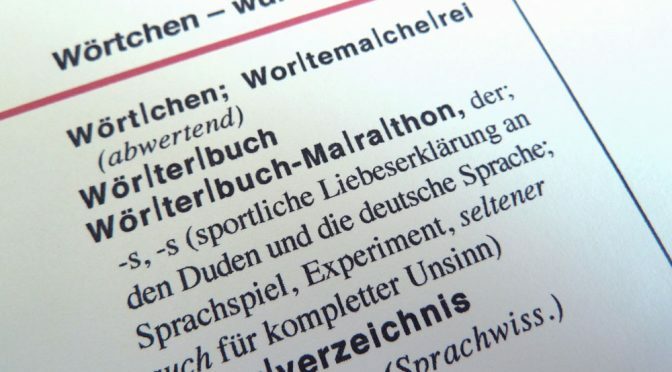 Lexi24 – this dictionary is different because you can learn German with “subtitles” in your mother tongue! This means that you could also learn some 30 other languages! Apart from that, there are 15 different vocabulary categories including even Medicine: Food, Clothing and accessories, Nature, Health and medicine, Transportation, Human being, Office, Sports, Housing, Leisure and entertainment, Society, Arts and architecture, Science, Energy and industry. This dictionary contains also a “training” section for about 30 different languages – you have to log in in order to use this feature. There is also a crossword puzzle for English – for every day a new one. This dictionary also doesn’t provide any sound/pronunciation. BABADADA – learn numerous foreign languages in about 40 categories. This dictionary is also special because it offers the “Hospital” category. This dictionary also does not provide sound/pronunciation which is its greatest weakness. 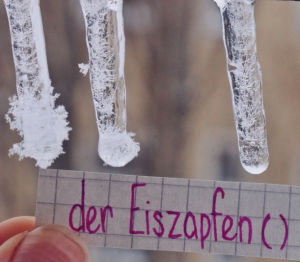 This is a German-German solution which is great for advanced learners. Important note for beginners: every word in the above dictionaries has its own audio version which you can listen and hear how you should pronounce the word in question. 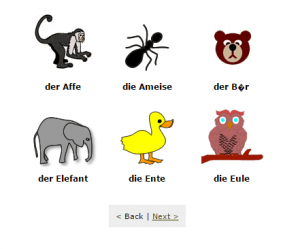 Learn German with your personal tutor – click here. This online dictionary will help you to translate any word in many different languages. 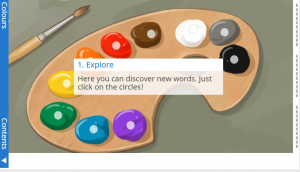 It also offers an online vocabulary trainer. This dictionary stands out with the huge number of language combinations that it offers. 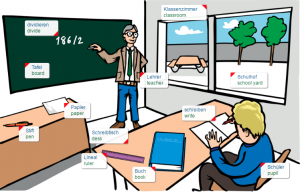 Among other usual combinations (like German – Englisch, German – Spanish etc. ), you can find the following “exotic” combinations: German – Latin, German – Esperanto, German – Serbian etc. That’s just great! This dictionary is intended for advanced learners. it contains only idioms with lots of examples.